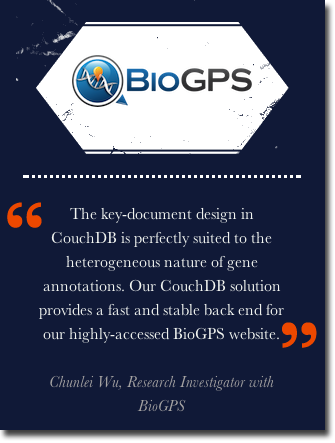 In May of 2010, we migrated our gene annotation database from Oracle to CouchDB, a document-oriented database. Our CouchDB instance is hosted at Amazon Web Services, storing the annotation data of ~400k genes across eight species. Even though we are currently running it on the most basic micro instance, it is consistently serving over 100,000 requests per-day with little to no maintenance on our part. Since the migration, we have been extremely satisfied with the boosted query performance and the speed at which we can develop new features. To share our success story, we recently posted a case study with CouchOne, the company behind CouchDB. If you are interested in what powers the everyday queries you do on BioGPS, check it out! Careful observers will also note this as the first appearance of our new logo, which will officially debut on the live site in the coming months.